Mild steel models are finished in grey (RAL 7035). Also available unpainted and in other colours on request. Machining available at additional cost. Available with wall mounting brackets and lifting eye bolts at additional cost. CE-CS compact range of floor standing enclosures are positioned between the smaller CE-ST wall mounted enclosures and the larger CE-1000 range of monobloc floor standing enclosures. CE-CS enclosures are manufactured from 1.5mm thickness mild (finished in grey RAL7035) or stainless steel, with 2mm thickness single or double door and two bar locking system. 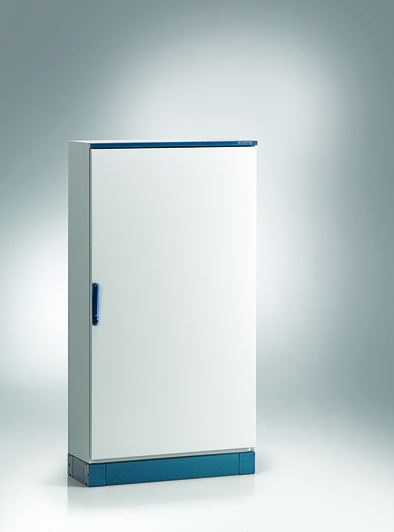 The CE-CS range is also available with a Plexiglass door. Each CS enclosure is supplied with a sheet steel mounting plate, which can be inserted from the front of the cabinet, and two gland plates to the bottom face. Floor mounting plinths are an option on all CE-CS enclosures. Various accessories include: wall mounting brackets, lifting eye bolts and custom machining. Mild Steel – powder coated paint RAL 7035 (grey) as standard or special paint colours available on request. 304 or 316 stainless steel.